I was inspired by PM Modi and his vision, says Gautam Gambhir. The Central Election Committee of the Bharatiya Janata Party has decided the names of 100 BJP candidates for the ensuing General Elections to the Legislative Assembly of Odisha while the Congress Central Election Committee has announced the seventh list of candidates for the ensuing elections to the Lok Sabha and the Andhra Pradesh Legislative Assembly. The BJP also announced on Thursday evening its first list of candidates for Lok Sabha elections that begin next month. Prime Minister Narendra Modi will contest from Varanasi in Uttar Pradesh, the parliamentary seat he retained after winning two seats in the 2014 election while BJP president Amit Shah will fight from Gandhinagar in his home town Gujarat; a seat where BJP veteran LK Advani is the sitting lawmaker. RJD's Manoj Jha announced the seat-sharing deal in Bihar between the Congress and the RJD today. Lalu Yadav's RJD will contest on 20 seats while Congress has got 9 seats, news agency ANI reported. Congress leader Randeep Singh Surjewala quotes a media report by Caravan on BS Yedyurappa. "BS Yeddyurappa made payouts to senior BJP leaders during his tenure as Karnataka chief minister. It mentions names of senior BJP leaders from Rajnath Singh to Arun Jaitley. There is an allegation of bribe of Rs 1,800 crore on the top BJP leadership." "The diary with BS Yeddyurappa's sign on it was with the Income Tax Department since 2017. If that is the case why did Modi ji and BJP did not get it investigated?" he asks. Samajwadi Party replaces its Ghaziabad candidate Surendra Kumar Munni with Suresh Bansal, for the upcoming Lok Sabha Elections 2019, reports news agency ANI. Bahujan Samaj Party release its list of 11 candidates for the Lok Sabha Elections. The Congress has slammed the BJP for dropping party veteran LK Advani's name from its first list of Lok Sabha candidates. Congress leader PL Punia tells news agency ANI: "An outstanding Parliamentarian like LK Advani will be replaced by Taripar Amit Shah. Now, people are clear that BJP is only run by Amit Shah." Prime Minister Narendra Modi slams Congress leader Sam Pitroda, a close aide of Rahul Gandhi, over his comments questioning the impact of the Balakot air strike. The opposition "is the natural habitat of terror apologists" and "insults our forces time and again", the Prime Minister has tweeted. Just hours after Nisith Pramanik was given the ticket to contest from the parliamentary constituency Cooch Behar, a group of Bharatiya Janata Party (BJP) party workers launched a protest in Cooch Behar against his candidature. The Indian Statistical Institute (ISI) has submitted its report to the Election Commission on how many or what percentage of VVPAT slips should be counted in each constituency. 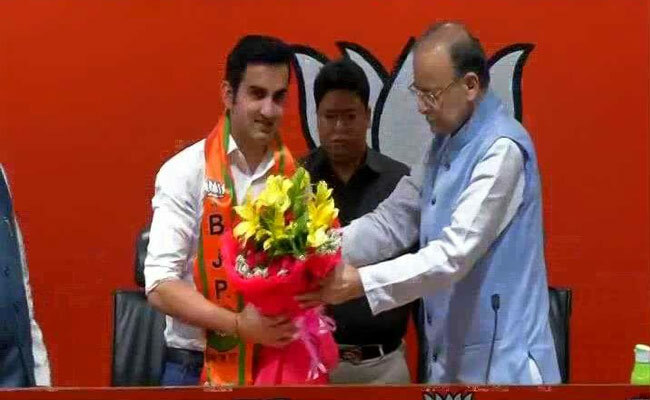 Former Cricketer Gautam Gambhir meets Bharatiya Janata Party president Amit Shah. Nara Lokesh, Andhra Pradesh IT Minister and son of chief minister N Chandrababu Naidu, will file his nomination shortly. He will contest from Mangalagiri constituency in Amaravati, reports news agency ANI. The party leadership will decide on Gautam Gambhir's role in the BJP, says Union Minister Arun Jaitley. "We try to induct people who have achieved excellence in their own fields." I was inspired by PM Modi and his vision, says Gautam Gambhir. "I am honoured to get the opportunity to join this platform." 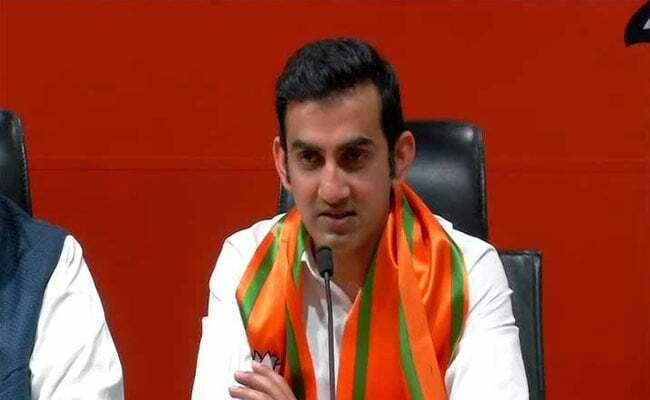 Former cricketer Gautam Gambhir has joined the Bharatiya Janata Party (BJP) ahead of Lok Sabha elections in the presence of Union Ministers Arun Jaitley and Ravi Shankar Prasad. The BJP takes a swipe at Congress president Rahul Gandhi after his news conference was deferred, claims the reason for the delay was his inability to wake up in the morning. "It seems Rahul Gandhi can't wake up in the morning. Anyway, it's better not to spread lies in the morning," the BJP's official account has tweeted. The Congress press conference that was scheduled for 10:15 am today, was deferred to 1 pm. Bahujan Samaj Party leader Mayawati says the BJP leaders are scrambling to declare themselves chowkidar for appeasement but people like Uttar Pradesh Chief Minister are in quandary -- whether to remain jansevak (civil servant ) or Yogi or became a chowkidar (security guard). "They are free for any fashion but must be committed to constitution and rule of law, this is what people of the country want," she tweeted. No worry if Rafale secret file is theft but official data related to joblessness, rising unemployment, pathetic conditions of labourers & farmers etc. not to be out in public. After all these are the issues related to image & vote. Do the country need such type of Chowkidar? Congress special press conference to be addressed by party president Rahul Gandhi at 1pm today, reports news agency ANI. South Indian actor Prakash Raj will file his nomination from Bengaluru Central as an independent candidate today, he said on Twitter. The BJP announced its first list of 184 candidates for the Lok Sabha elections on Thursday. The party nominated Smriti Irani once again from Amethi to take on Congress president Rahul Gandhi. The parliamentary constituencies in the state, which will vote on April 11 in the first phase of the Lok Sabha elections are Baghpat, Bijnor, Gautam Buddh Nagar, Ghaziabad, Kairana, Meerut, Muzaffarnagar and Saharanpur. Results will be declared on May 23. Six BJP parliamentarians from Uttar Pradesh, including Union Minister Krishna Raj and National Commission for Scheduled Castes chairman Ram Shankar Katheria, have been benched ahead of the Lok Sabha elections. The "grand alliance" of opposition parties in Bihar is intact and its candidates for all the 40 seats in the state will be announced after Holi, Rashtriya Janata Dal (RJD) leader Tejashwi Yadav said on Wednesday. Sharad Yadav, whose Lok Jantrik Dal (LJD) is one of the constituents of the grand-alliance, had earlier said candidates will be announced at a press meet in Patna today.